Category. Endangered species. The extent of occurrence is less than 5000 km2, the area of occupancy is less than 500 km2. The main threat is the habitat disturbance caused by the development of road network. It was included in the first edition of the Red Data Book of Armenia under Category 2: Rare species. It is not included in the Annexes of CITES and that of the Bern Convention. Description. Semishrubs, forming dense cushions up to 2 m in diam. Leaves triangular in transverse section, 1–4 mm long, 1 mm wide, imbricate. Calyx 2–3 mm long; teeth obtuse. Petals longer than calyx, entire, white or pinkish. Distribution. In Armenia it grows in Yerevan (Urts mountain range, surroundings of the villages Tigranashen, Elpin) and Zangezur (Vorotan river gorge) floristic regions. EOO is 600 km2, AOO is 30 km2. The number of locations is 2. Besides Armenia the species grows in Nakhichevan, North Iran and Middle Asia (Turkmenia). Ecological, biological and phytocoenological peculiarities. 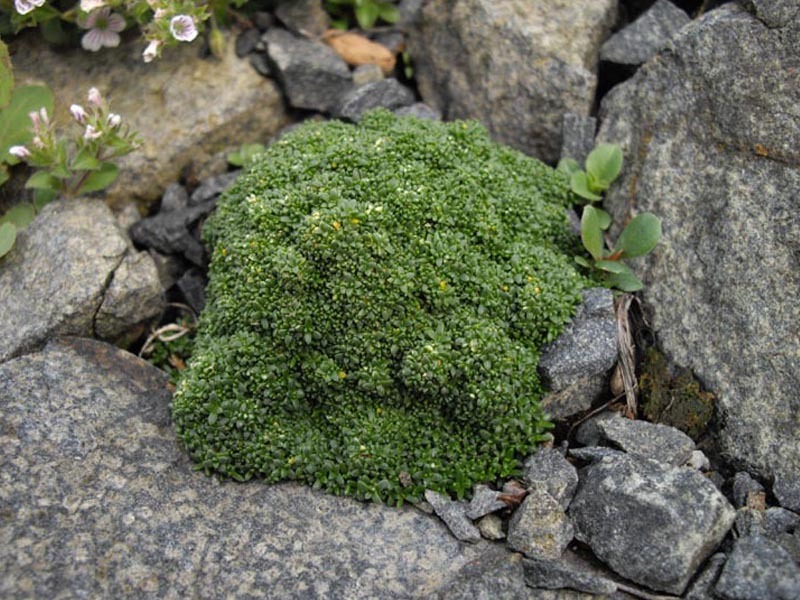 Grows in middle mountain belt, at the altitudes of 1300–1900 meters above sea level, on rocks and cliffs. Flowering from July to August, fruiting in September. The second blossom is often observed from September to October. Limiting factors. Restricted extent of occurrence and area of occupancy, loss/degradation of habitats caused by road construction. Conservation actions. The part of the population grows in "Khosrov Forest" State Reserve. Necessary: monitoring of the population state.